5 Star Quality HVAC specializes in hot water heater installation and replacement services for your Aurora residential or commercial property. If your hot water heater is leaking, outdated, draining your energy bills, or not heating water like it should, it is time to consider new water heater installation or water heater replacement. We can provide you with an upgraded water heater model of the highest caliber. Our hot water heater installation and replacement experts will guide you in finding the best water heater type for your Aurora home or business, at an affordable water heater installation cost to give you satisfaction and peace of mind. Our water heater repair and replacement crews are experts in tankless water heaters, gas water heaters, and electric water heaters, so no matter what type of water heater you replace or install, we have the solution for you. Need a Water Heater Installed? 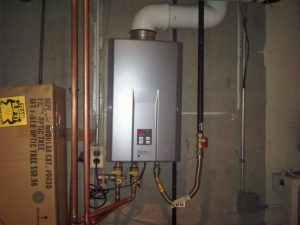 Tank Water Heater Vs. Tankless Water Heater: Tank water heater installation is often less expensive than tankless water heater installation, however, the lifespans of tankless water heaters along with energy-saving costs will most likely even out the initial cost of tankless water heater replacement. Size of Tank: Most tank water heaters in residential homes hold about 40-50 gallons of water. The larger the tank, the more it might cost. Commercial water heaters are generally much larger; however, our hot water heater replacement contractors ensure that we maintain fair pricing on all tank water heater installs. Gas Vs. Electric Fuel: Electric water heater installation can sometimes cost less than a gas water heater installation, however, gas water heaters sometimes require less cost to run and maintain, so the water heater replacement cost may even out over time. Tankless Water Heater Energy Factor: If you are considering a tankless water heater installation or replacement, the models with a higher energy factor (which determines the efficiency of your tankless water heater) can affect the cost of water heater replacement. Additional Items: Manufacturer warranty length, permits, and coding can also come into play when determining hot water heater installation cost. When Do I Need Water Heater Replacement vs Water Heater Repair? Our plumbing and water heater service technicians often get asked, “How many years does a water heater last?” Our dependable plumbing repair teams can help you determine if your hot water heater needs repair or a tune-up, or if the problem will only be solved with a new water heater replacement. Our goal is to always try to make repairs when possible, but if your water heater is over a certain age, leaking consistently, or needs major repairs too often, we can help you decide on an affordable, energy-efficient hot water heater replacement for your Aurora home or commercial property. Whether you want a tankless water heater, or more traditional gas or electric water heater, the 5 Star Quality HVAC contractors can find the water heater solution that best fits your Aurora commercial or residential needs. Contact 5 Star Quality HVAC today for your affordable water heater installation and replacement!